The most common way to access Spatial Analyst functionality is with the geoprocessing tools. This rich environment allows you to quickly and easily organize and execute the tools necessary to complete your analytic tasks, as well as providing a mechanism to automate, document, and share your workflows. Map Algebra is a powerful algebraic language for performing raster analysis. Map Algebra is fully integrated into the Python environment. There is also a Raster Calculator tool that allows you to easily create Map Algebra expressions in a tool dialog or in ModelBuilder. Following is further discussion of each of these components of the Spatial Analyst experience in ArcGIS Pro. Spatial Analyst provides over 180 geoprocessing tools to perform spatial analysis operations. In addition to the purely analytic tools, general categories of these tools include those that perform basic mathematical and logical operations, as well as raster dataset creation and processing. The tools are organized by groups of related functionality into 20 toolsets. Map Algebra is fully integrated into the Python environment. The syntax for creating Map Algebra expressions in Python is very similar to what you are already familiar with from the Raster Calculator. 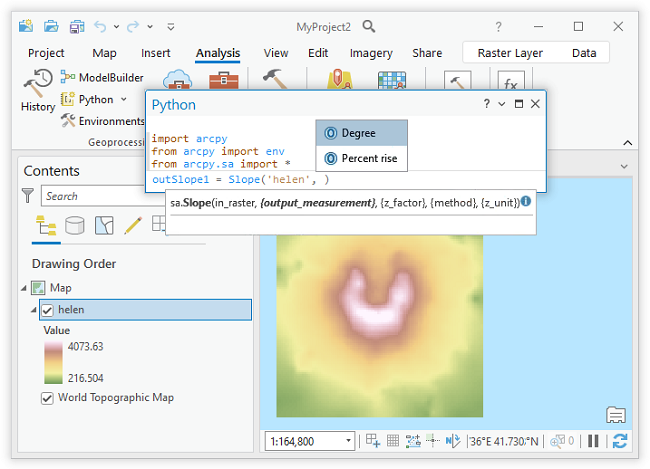 The Python environment in ArcGIS Pro improves on the previous experience by full command autocompletion, expanded scriptability, and deferred execution.